As new parents, my wife and I wanted to find a way to teach our children about money, so we agreed on using a weekly allowance to accomplish this. We thought it equally important to teach our children good values as related to money (saving, spending and charity) to help them develop positive habits early on that would last them the rest of their lives. This was when we came up with the idea of using three cups. We've tried to teach our children that it is not how much money you have that is important, it's how you use it. The three cups we have given them have led us on many wonderful adventures together and have brought our family a lot of joy. 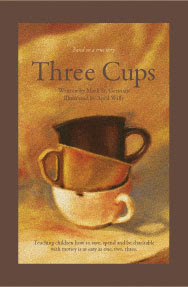 We hope you will experience the same joy, excitement and success using three cups with your children... and will share the Three Cups story with others. This endearing, true story of love, responsibility and charity is retold tenderly by Mark St. Germain whose stage, television and screenwriting credits include: Camping With Henry and Tom, Gifts of the Magi, The Cosby Show, and the critically acclaimed motion picture Duma. This was one of the most inspiring childrens books I have ever had the pleasure of reading. I also state; if I have another child, I will use the Three Cup method. However, if using as a birthday gift, don't make it the only gift, as suggested in the story. In today's cruel society, the child would be devastated. Still, I HIGHLY recommend to all parents with small ones, and even parents-in-planning, incorporate this story into bedtime. A great book to help teach our kids the skills they need. We tried to teach our kids about money using an allowance--many years ago now...this sure would have been helpful! Nice! Am now curious about how the 3 cups work! I had no idea based on the cover and title what this was about. I wish someone would have taught me about money, maybe I wouldn't be so broke now.